I. Roslyakova, B. Sundman, H. Dette, L. Zhang, I. Steinbach. 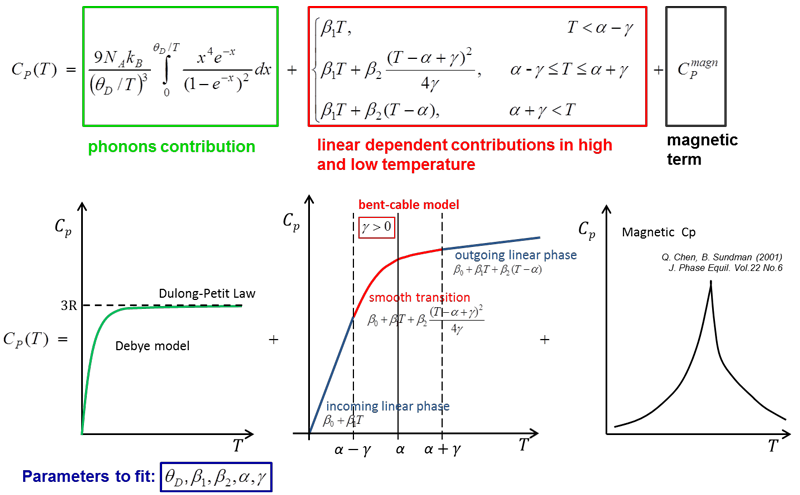 Segmented regression model for the heat capacity of solids. A novel thermodynamic modeling strategy of stable solid alloy phases is proposed based on segmented regression approach. The model considers several physical effects (e.g. electronic, vibrational, etc.) and is valid from 0 K up to the melting temperature. The preceding approach has been applied for several pure elements. Results show good agreement with experimental data at low and high temperatures. Since it is not a first attempt to propose a “universal” physical-based model down to 0 K for the pure elements as an alternative to current SGTE description, we also compare the results to existing models. Analysis of the obtained results shows that the newly proposed model delivers more accurate description down to 0 K for all studied pure elements according to several statistical tests.